Dr. Jessica Adams: It should have been me. It was my theory. I held the needle in front of the patient that set off his paranoia. If you're looking for someone to blame... blame me. Many would say that the quality of House has been declining since season 5. On some levels i'd agree but for me the quality has been good enough to keep watching, its still a mile better than 90% of the shows out there. 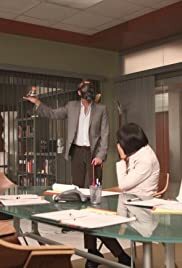 I feel that the shows worst moments have come since season 5 but the best moments have been spread out through all 8 seasons and "Nobody's Fault" is a clear cut example of this. I won't reveal much of the plot, but this episode breaks the normal structure of a House episode and excluding season finales/openers, this is the best time they've done it. The script is immaculate, especially the back and forth dialogue between Cofield and House. The acting is superb from everyone involved, with special credit going to Wright, Laurie and Spencer. The directing is magnificent, to the point where the Emmy award winning director Yaitanes called it his "proudest work". Overall this episode is a fine example of why House is not just a successful show, but also a unique and classic program. "Nobody's Fault" joins an elite group of House episodes such as "Three Stories", "No Reason", "House's Head/Wilsons Heart" and "Broken". The episode's content and quality make it more than worthy of a season finale. I recommend this episode to anyone, but most importantly to those who have lost faith in the show.